For weeks now, my Significant Other and I have been looking forward to spending some quality time with two of our best friends from the Boston area. 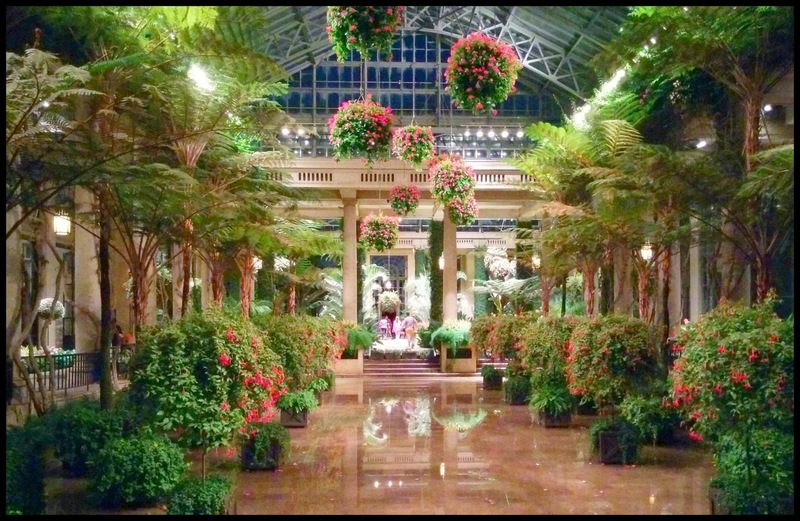 We planned to attend an outdoor symphony Saturday night at a local botanical garden, Longwood Gardens (If you've never been, and you live in the PA area, make it a point to go!). That, however, was as far as our planning went. We had no idea where to go eat prior to the event. Ultimately, we decided to take a chance on the site's fine dining restaurant, 1906. If I'm honest, I wasn't terrifically hopeful about the food: I mean, sure, it says it's fine-dining, but sometimes that just means ordinary-food-with-extraordinary-prices. Despite our lack of reservations, we got a table immediately. Seated under the arms of huge old oak trees, we ordered and were blown away by course after course: soft brioche with heavenly whipped butter, chilled cucumber soup, delicate salmon with balsamic tomatoes, deliciously tender steak... everything was perfect. Though the symphony that followed was excellent, the talk of the evening was, decidedly, the amazing food. While reminiscing over Sunday breakfast about our delicious evening, I realized that what truly set the restaurant apart was that nearly all of the food was locally sourced. 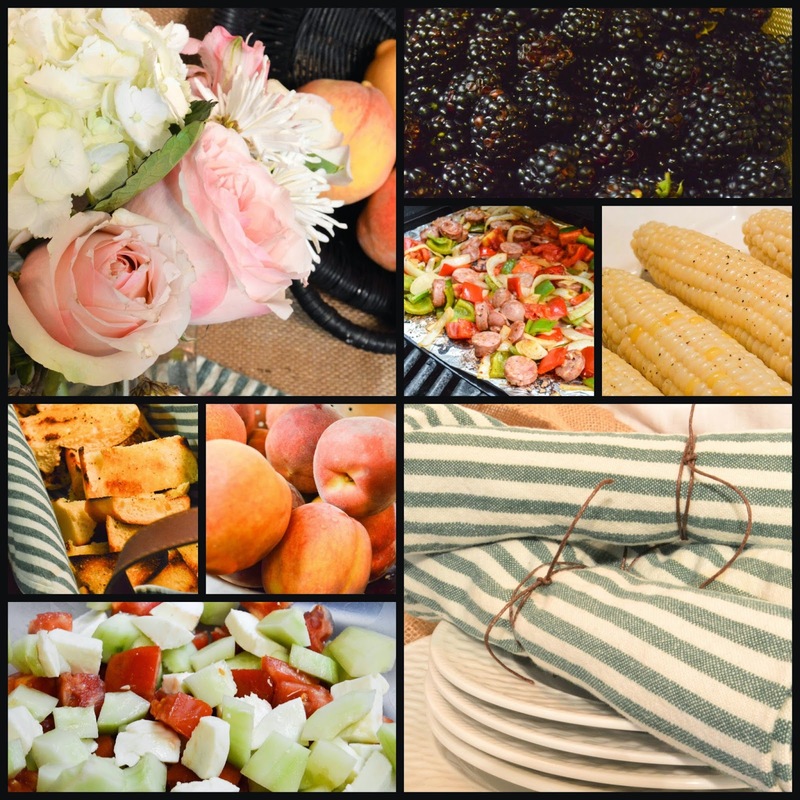 The four of us spent a beautiful (albeit HOT) afternoon wandering through rows of trees, bushes and vines, picking fresh peaches, berries, grapes, peppers, tomatoes, cucumbers and corn. We completed our grocery list at the farm's market with fresh heavy cream, a soft mozzarella, garlic dressing, two kinds of sausage, onions and a loaf of crusty bread. Once home (after much needed showers and clothing changes) we set to work creating a simple but exceptional meal that was bursting with flavor. 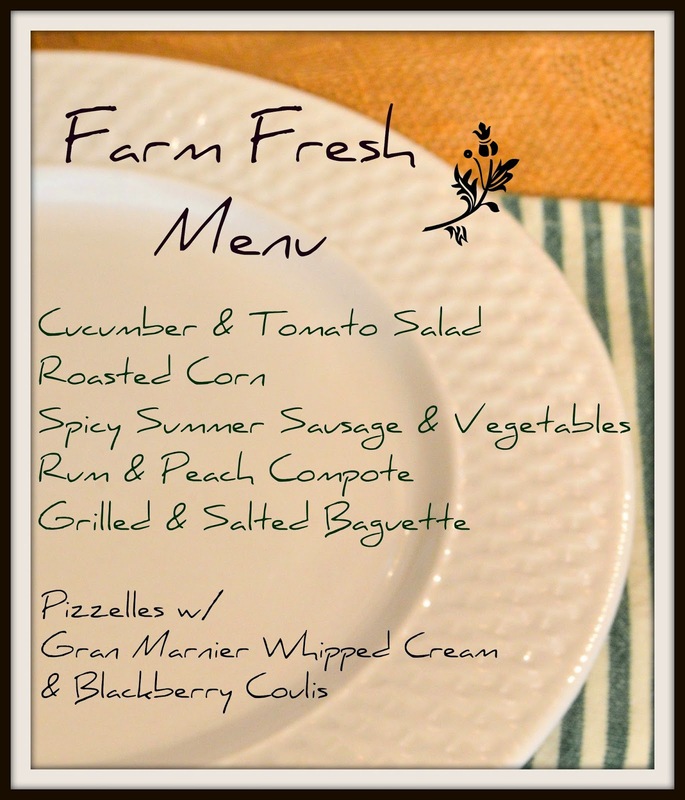 On the menu: Spicy Summer Sausage and Vegetables, Crisp Cucumber & Tomato Salad, Roasted Corn, Rum and Peach Compote in individual pouches, and Grilled Baguette with olive oil and sea salt. I don't think I'm overstating it when I say that our meal of modest farm fresh ingredients was possibly one of the best ever. Evvvvvvver. 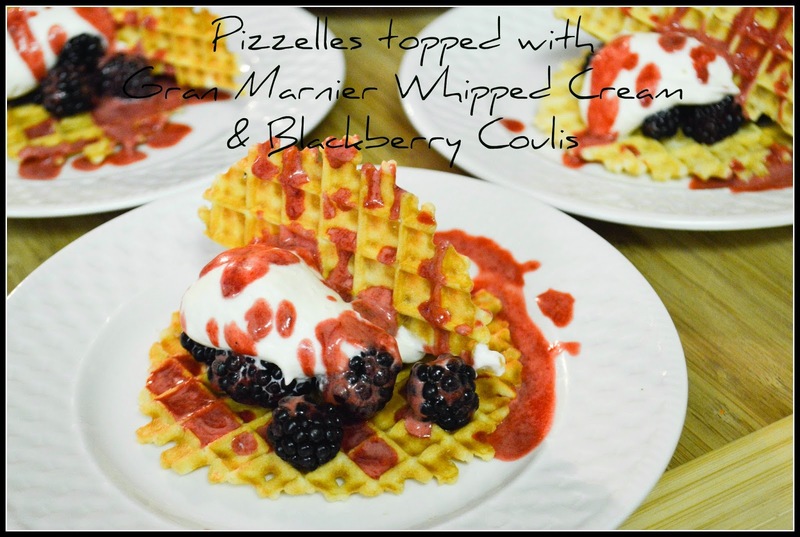 Despite being filled to the brim, we managed to find room for a coffee and a simple dessert (nobody likes a quitter): Pizzelles topped with Gran Marnier Whipped Cream and Blackberry Coulis. If you're not drooling yet, you should be. 1. Preheat grill over medium-high heat. 2. 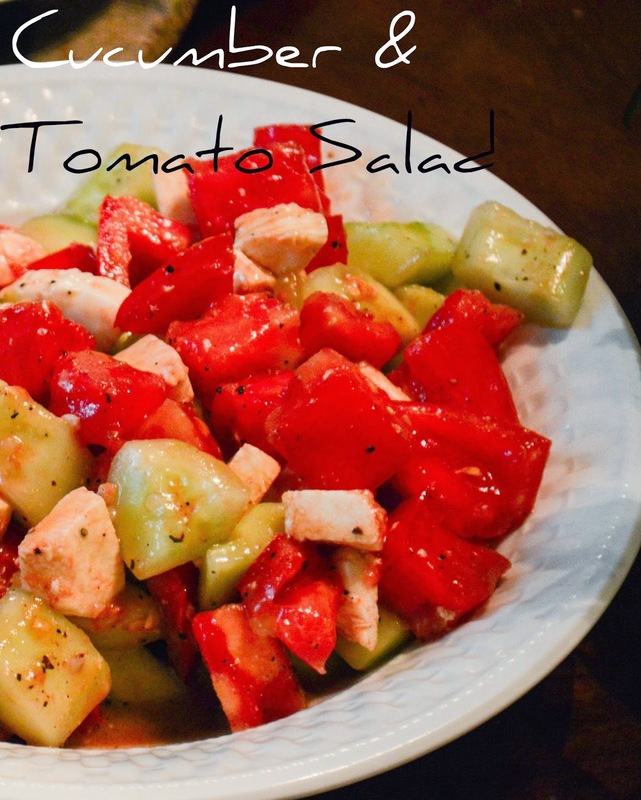 In a pan, combine beer or cider, crushed red pepper flakes and season salt. Place pan on top rack of grill. 3. Grill whole sausages until heated through. As each is finished, add to beer mixture. 4. On a grill-safe sheet pan, toss olive oil with bell and chili peppers, onions, salt and pepper. 5. After seasoning the vegetables, mix in sliced sausage pieces. 7. 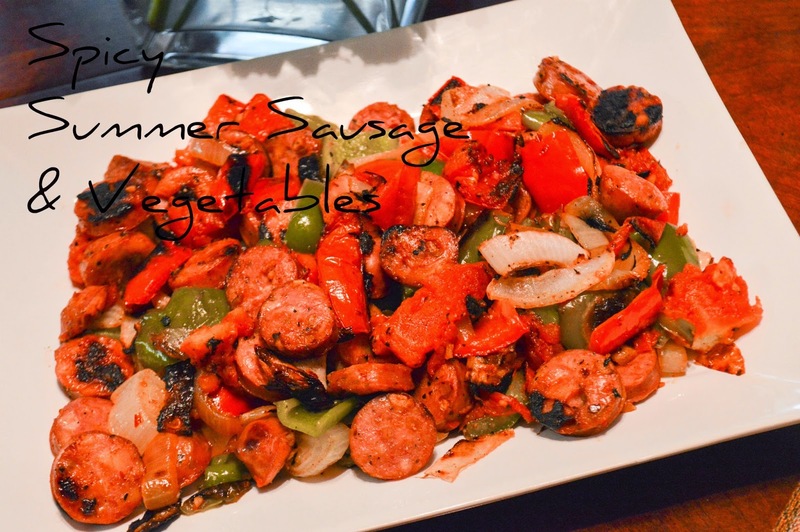 Plate veggie sausage mixture. Add whole sausages and several spoonfuls of beer mixture. 2. Gently toss, until coated. 1. 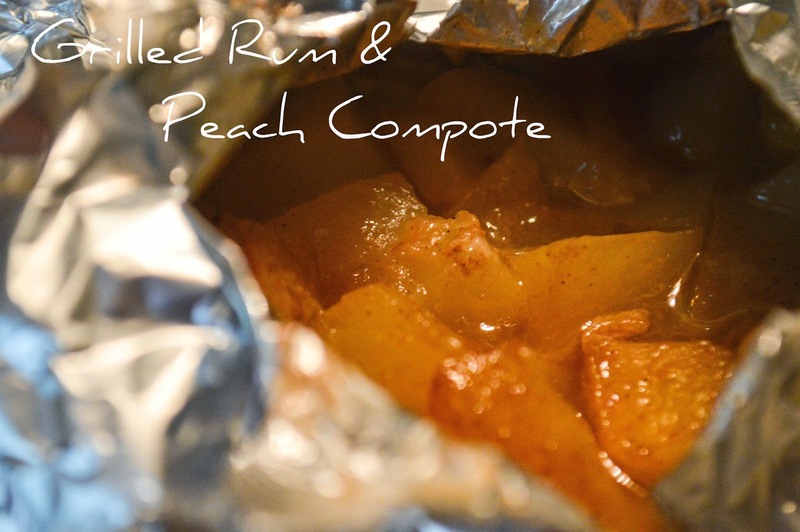 In a large bowl, combine peaches, brown sugar, rum and vanilla. Fold together until evenly coated. 2. Place 1/4 of the peach mixture, plus one tab of butter on the top half of 1 piece of foil. Fold the bottom half over the mixture. Quickly roll the edges together, forming a pouch. 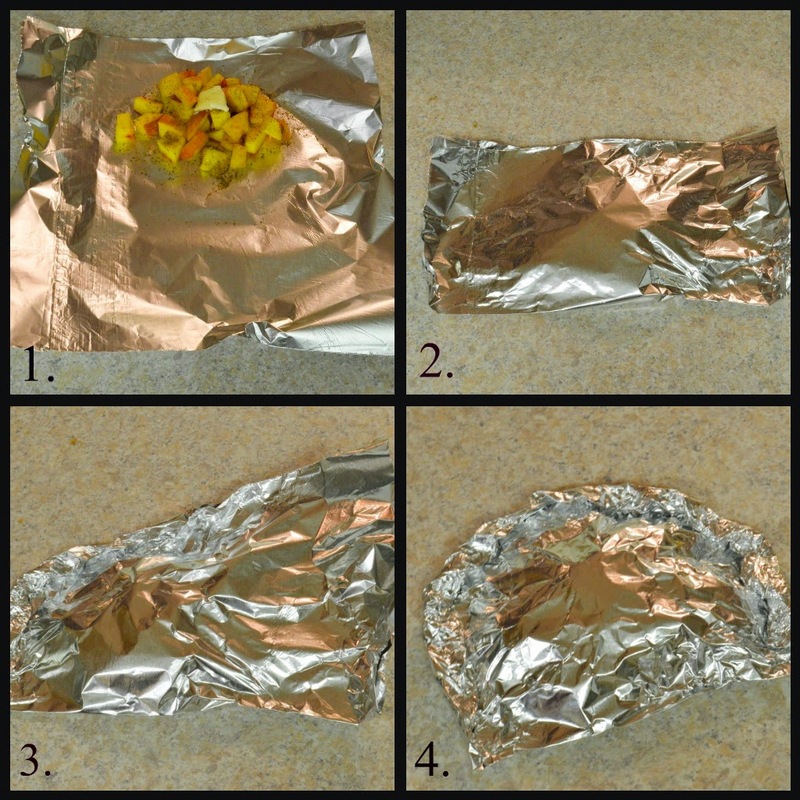 Repeat with the remaining three pieces of foil. 3. Place all four pouches on a grill-safe baking sheet. Punch a hole in each to allow steam to escape. 4. Grill for 10- 15 minutes. (If you're short on grill space, place the cookie sheet of pouches in a 425 degree oven for 10-15 minutes). 1. With a mixer, beat heavy cream, vanilla, powdered sugar, Gran Marnier and salt on high until stiff peaks form. Place in refrigerator until ready to use. 2. Place 1/2 c. blackberries in small saucepan, and blend with immersion blender until mostly smooth. 3. Add granulated sugar to blackberry mixture. Heat over medium until sugar dissolves. 4. Remove pan from heat. Add 3/4 c. of whipped cream to blackberry mixture, stirring until combined. 5. Strain mixture with sieve. 1. Place a small dab of whipped cream on the center of the plate. 2. Place pizzelle on top of whipped cream. 3. Add a larger dollop of whipped cream to the center of the pizzelle. 4. Stand half a pizzelle vertically in the middle of the whipped cream. 5. Drizzle with coulis. Add 1/2 cup of berries to each plate, and garnish with a sprig of mint.